Author and independent researcher Rinna Saramäki, at the moment working with issues related to the textile and clothing sector, talked with us about textile materials and what one should remember when buying clothes. She has recently published a book titled Hyvän mielen vaatekaappi about ethical problems in the clothing industry, and for her textiles and clothes are not just for staying warm but they bring joy and pleasure and bear an interesting history with different cultural aspects. According to Saramäki, it is difficult to precisely describe what makes a good-quality material, as some fabrics are meant to be of loose weave while others have the better the quality the denser the weave. There are some signs one can look for to easily figure out the quality of the material. For example, if a fabric that is not meant to be fleecy seems fluffy on the surface, it will probably wear out quickly. Nowadays the main problem with clothes is not them wearing through but that they lose their appearance, after which it is difficult to reuse them. Usually the garments that wear out the fastest are of mixed fabric, which is hard to recycle into new products. Rinna Saramäki finds pros and cons in both natural fibres and oil-based materials. Natural materials have been used for thousands of years so people have learnt the best ways to process and use them. Their production has heavy environmental impacts, however. The most common natural fibre, cotton, is grown around the world and the cultivation requires lots of land and enormous amounts of water, usually fertilizers and pesticides as well. Wool, as fine a material as it is, is also problematic: herds of sheep may contribute to desertification by eating away all vegetation, and all animal production bears a risk of causing suffering to the animals. Oil-based materials, i.e. synthetic fibres, do not take up cultivation area from food plants. Synthetic fibres are also mechanically very durable and do not wear through, but on the other hand they do not wear off beautifully either: it is fine when linen fades a little, but when acrylic gets nubby, no one is happy over its life marks. Being practically eternal also has downsides: oil-based products will stay here forever unless they are burned for energy or recycled. Recently, people have also become aware of micro fibres, i.e. the small fibres that come from especially synthetic materials and end up in oceans harming sea life. The extent of the problem is still unclear as are the means of solving it. Regarding materials that one should avoid buying, Rinna Saramäki lifts up acrylic. It only feels and looks good for a while and quickly gets pimply. Those nubby acrylic sweaters that no one wants are all around and there are no ways to recycle them. The worst cases are those where a weak fibre such as viscose has been mixed with the acrylic fibre – those products turn down right horrible over time. Therefore, durability does not always equal ecologicality: a product that mechanically lasts forever but loses its appearance over time is not very ecological, as no one wants to use it anymore. 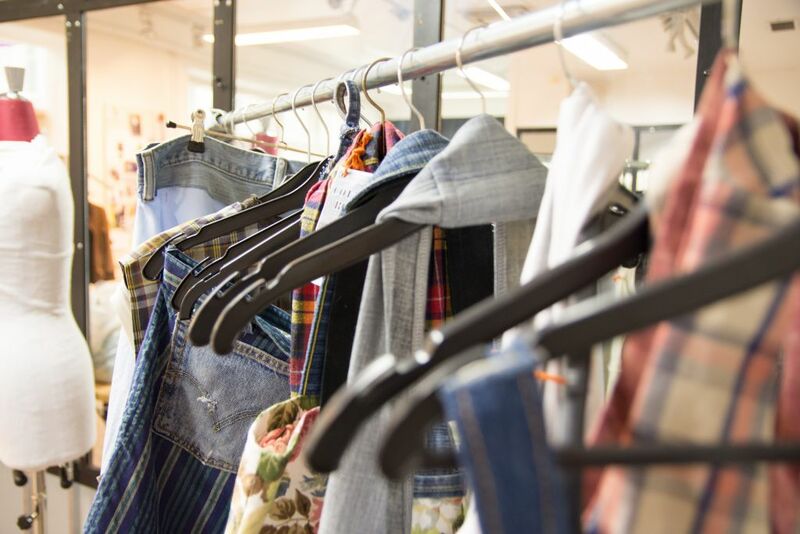 The most important thing to remember as a consumer is that materials and recycling the clothes are of secondary significance compared with how much one shops in the first place. If one constantly buys new clothes, it does not make much of a difference if they are ecologically produced. Besides acrylic, also leather can be a problematic material. Most of it is produced and processed in countries that either do not have animal rights legislation or choose to ignore it, not to mention the people handling toxic substances to process the leather. The consumer should always find out where the leather comes from and how it has been processed when acquiring leather products. Saramäki says that while one can get used garments of really good quality even for free, in new clothes usually price goes hand in hand with quality. Some basic garments manufactured in mass-production may be of good quality and have a low price, but generally the cheapest products are to be avoided and the more complicated garments and better quality one wants, the more one must be ready to pay. Cheap clothes are also ethically questionable, as often the workers’ rights are not respected when the producers aim for the lowest price possible. Designers have the best opportunities to affect the life cycle of a garment, even though they, too, must work within the limits set by the budget and technical possibilities. They can, however, choose how to use the limited funds and what to compromise over, both of which affect how long the garment can be used or how it can be recycled. Rinna Saramäki hopes that designers understand that designing clothes is not merely about figuring out a nice silhouette and colour for the garment but also thinking through the process as a whole: how the consumer buys the garment, how it is taken care of, how it is worn and what happens to it after use. Saramäki says that the most important thing to remember as a consumer is that materials and recycling the clothes are of secondary significance compared with how much one shops in the first place. If one constantly buys new clothes, it does not make much of a difference if they are ecologically produced. She also advises everyone to be open for different materials when shopping for new clothes. For example, the environmental problems linked with cotton mostly origin from it being grown in areas unnatural for the plant, requiring artificial irrigation and pesticides; hence it would be ecologically favourable if consumer demand would spread more evenly for other textile materials as well. In the end, however, the most influential choice a consumer can make is to only buy clothes one actually wears. Saramäki also hopes that the consumers would look at the washing instructions and material information tags more closely and care for the materials properly. She says she was surprised to learn how often people buy clothes without knowing what they are made of and how the material should be treated. Sometimes the washing instructions also reveal the quality of the product. If a simple shirt made of 100 % cotton is instructed to be washed in 30 degrees, the quality of the work is probably so bad that it prevents washing the garment in higher temperatures. Regarding the future of textile production, Saramäki is eager to see how the pulp-based fibres and materials can be refined into textile fibres of good quality. She thinks it looks commercially realistic that within only a few years material could be recycled into new textiles without them decreasing in value.